Fire ants are a problem that have been spreading across the United States over the last century. They first arrived in Alabama onboard ships from South America. They took up residence there and each year they seem to push out a bit further. Currently there are known colonies from coast to coast in the southern part of the United States. Colonies have been reported in California and as far north as Virginia on the East coast. If fire ants invade your yard, you may be facing a number of issues. Fire ants are aggressive. They will kill small animals that they attack as groups. They will also often sting you multiple times, since they release a pheromone once they sting someone. The other ants read this as a signal that the person is a danger and will swarm out to attack. The fire ant will bite you to get a grip, and then sting you from their abdomen. This releases a toxin into your skin. Fire ants can be dangerous to you, your children and your pets. Fire ants are identifiable by their color. They can be up to a quarter of an inch long. They will have reddish head and brown or black bodies. The bites themselves look like small pustules, similar to a pimple. A fire ant bite will actually have pus inside of the bite from the poison that is injected into your skin. The skin around the bite may be red and there may be some minor swelling initially. If you are bitten, you can treat the bite for itchiness and take an antihistamine. If the swelling continues or you have trouble breathing, you should seek medical care. Fire ant mounds are different from other ant mounds in a few distinct ways. The first is that fire ant mounds tend to be larger than other ant mounds. The mounds can reach up to 18 inches high, but that tends to be in areas where they are not disturbed in yards, they may only be a few inches high. Fire ant mounds will not have a hole at the top of the mounds like other ant mounds do. Fire ants set up an extensive tunneling system that can extend more than 24 feet away from the mound itself and they will enter through one of the tunnels. Since fire ants are so aggressive and invasive, it is important to treat for fire ants as soon as you find them. There are several different methods that you can use to fight offer fire ants. One option is to till the ground where fire ants are setting up a colony on a regular basis. This will disrupt the colony and encourage them to move to another area. Clemson recommends this option if you are trying to deal with fire ants near or around your garden. Another option is to drench the fire ant mound in a chemical designed to eradicate fire ants. The issue with this method is that it may not be safe to use around a vegetable garden. It is important to read the label carefully to determine if it is safe for the area that you need it to work. This can be difficult since the fire ants may retreat into a part of their tunnels that the chemicals do not reach. A third option is use fire ant baits. You will spread these around the mound and the ants will carry them inside of the home. These baits stop the colony from producing new ants, but they are not as effective of killing off the adult ants, which means it can take time for the colony to die out. Another option is to apply a granular insecticide to the top of the mound. It is important to read the labeling carefully to determine if it is safe to use around vegetables. Finally, you may want to contact a professional who can choose the proper treatment method and is trained in the safest ways to apply it. This can protect both you, your family, pets and any garden that you have on your property. They may use a combination of methods to eliminate the colony. If you are considering treating the fire ants yourself, be careful if you choose an insecticide spray. You do not want a spray that will harm the good insects in your yard. These pollinating bugs are necessary if you want your garden to flourish. The methods where you apply it directly to the ground are the safest. If you are concerned if one of the products you choose might hurt bees, a professional exterminator can choose the best and safest methods for your garden. Fire ants can actually invade your vegetable garden and eat some of the plants. They enjoy eating Irish potatoes, okra and young corn plants. 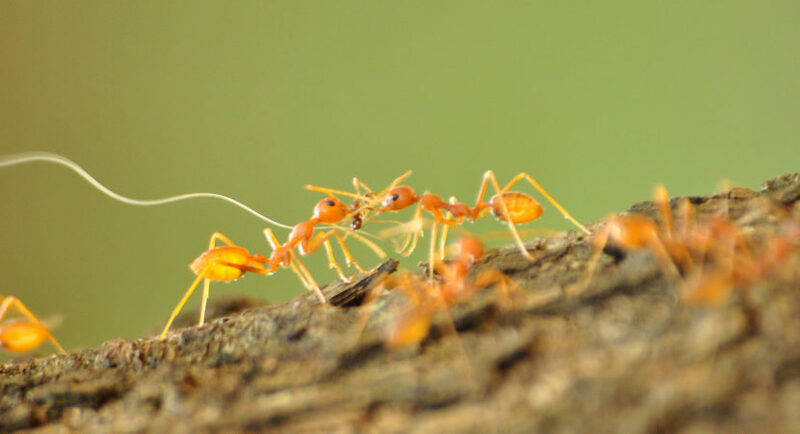 You can safely treat the areas around your garden for fire ants, but if you have a colony that has established itself, where you grow vegetables, it can be much more difficult to treat the fire ants. Regularly tilling the area around your garden can stop this type of colony from establishing itself. If you do find fire ants in your garden, you will need to look for a product that is approved for vegetable gardens. Most over-the-counter treatment methods are not approved for use in your garden. You can use them in the area around your garden, but it is not a safe to use them where the plant roots may be since the plants can absorb the chemicals and make the food unsafe to eat. Professionals have access to more treatment options that are effective against fire ants while still being safe for your garden. If you spot a fire ant mound anywhere in your yard, you should treat it right away. It is easier to eliminate the colony before it becomes well-established. If you can eliminate the ants before they move into your garden, you can make sure the food that you are growing is safe to eat.